Today is another great challenge over at SweetStamps. I love that wreath!! I dabbed it with a Q-Tip, using three different colors of distress inks. Then I added the gold and red pearls. I had finished the card, then went back and added the snow, which I think it looks great now. Beautiful card, love that wreath stamp! Just LOVE how you decorated it up with the "snow" and pearls, so beautiful!! Thank you so much for playing with us this week at Inspired By Stamping Inspirational Challenge!! SOOOO beautiful! I love the snow and gems on the wreath! Your wreath is so realistic - love your card! Glad to have you join us at Dynamic Duos this week! Love the snowy wreath, gorgeous. 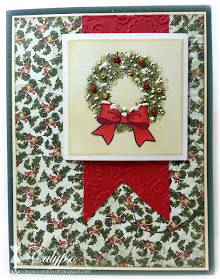 What a gorgeous card, that wreath looks fantastic and the paper is wonderful and christmassy. Thanks so very much, Calypso for this help. Love the design of your card. Love the embossing on the red layer and the added snow and pearls. Beautiful! !